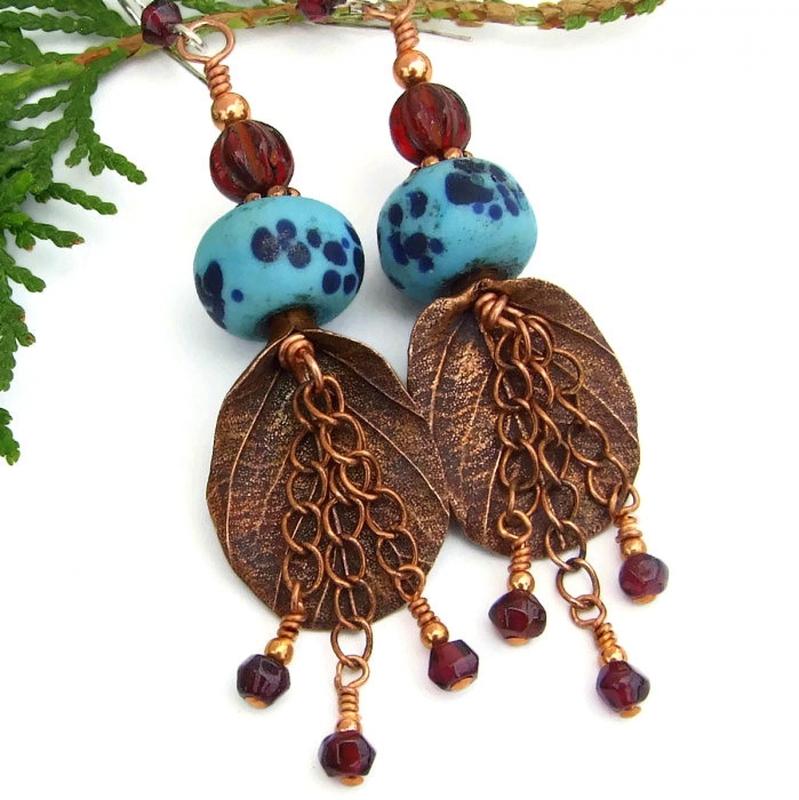 Looking as if they are part of an exotic plant in a lush tropical forest, the RAINFOREST DREAMS handmade earrings are definitely not your ordinary earrings. 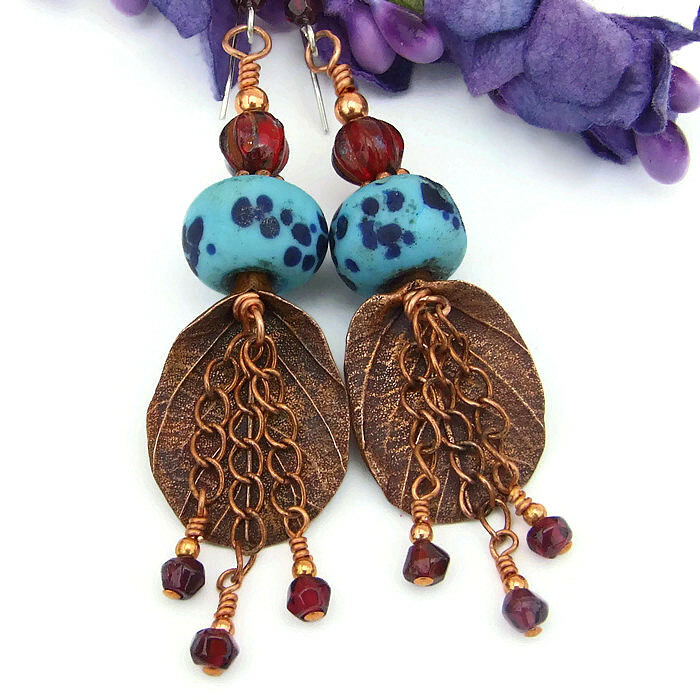 Filled with earthy boho goodness, the one of a kind earrings feature artisan copper leaf charms and rustic artisan made dotted turquoise blue lampwork glass beads. 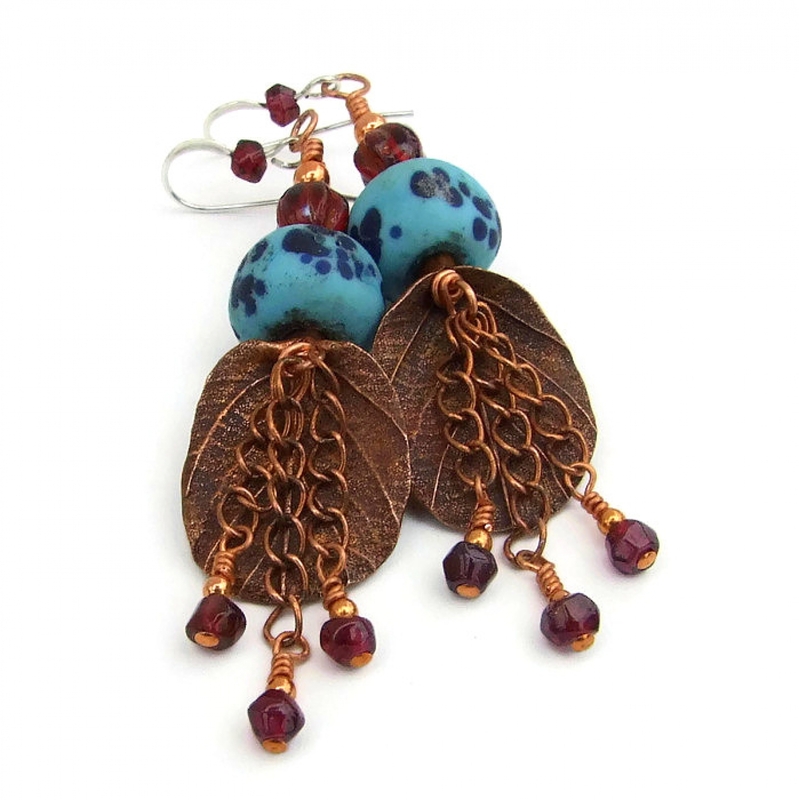 Copper chain dangles with faceted red garnet and garnet red Czech glass complete the fascinating jewelry design. The copper leaves were individually artisan handcrafted - as you can see in the photos, they are very similar in design but are somewhat different, just like natural leaves. The leaves are filled with incredible detail with the top of each leaf somewhat folded together at the top. To add unexpected eye appeal and much movement, twisted link copper chain was wire wrapped into the folds to dangle down. A rich red faceted garnet nugget with a hint of purple was attached to the end of each chain. 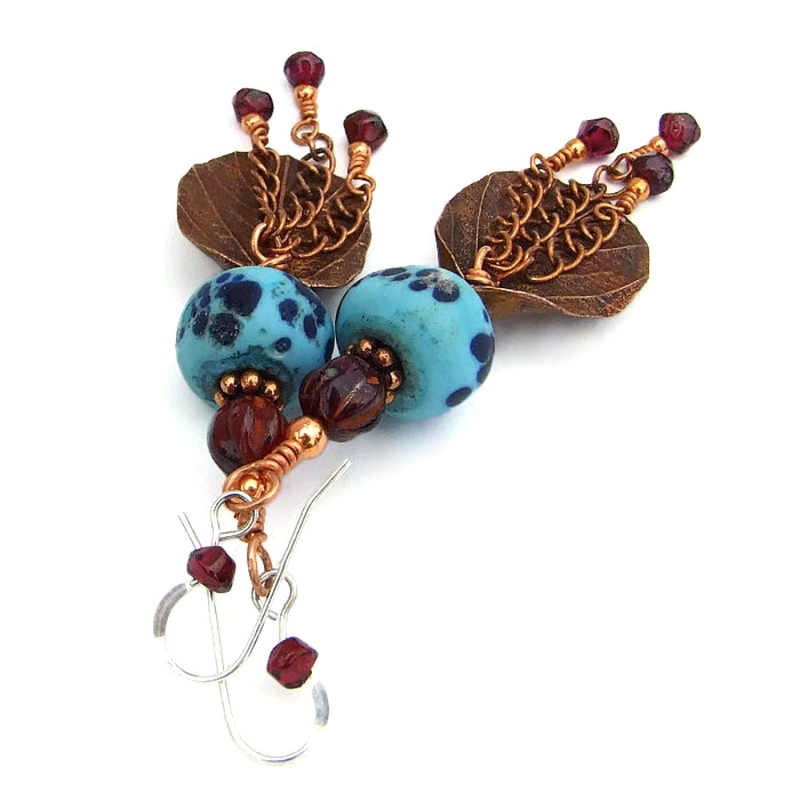 To perfectly highlight the beauty of the copper leaves, rustic artisan lampwork glass bead were added to the top of the leaves where the stem would be. The lampwork beads were created with a base of light turquoise glass with darker blue spots and splotches. The lampwork beads are not perfectly round, but more of a nugget shape, and they were lightly acid etched for a velvety matte finish. A translucent ruby red Czech glass melon bead was placed on top of each lampwork bead, separated by a copper daisy spacer. The melon beads have a light tan Picasso finish which settled in the creases between each ridge for an antiqued look. 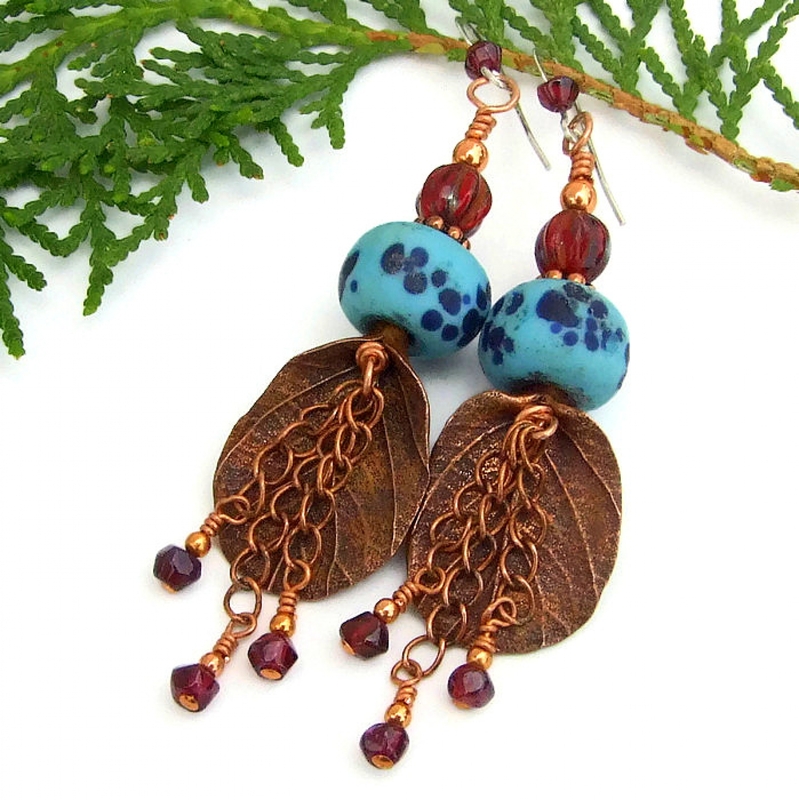 All of the elements used to create the earrings were strung on copper wire, wire wrapped and connected to sterling silver French hook earwires. For extra adornment, a garnet nugget was added to each earwre. 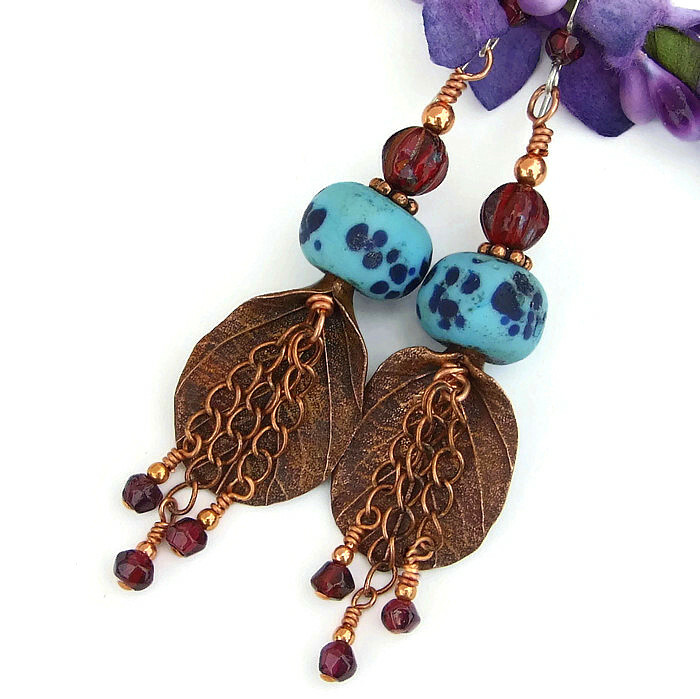 Carefully designed and handmade by Catherine of Shadow Dog Designs, the RAINFOREST DREAMS earrings were crafted for the woman who loves jewelry with an exotic flair. 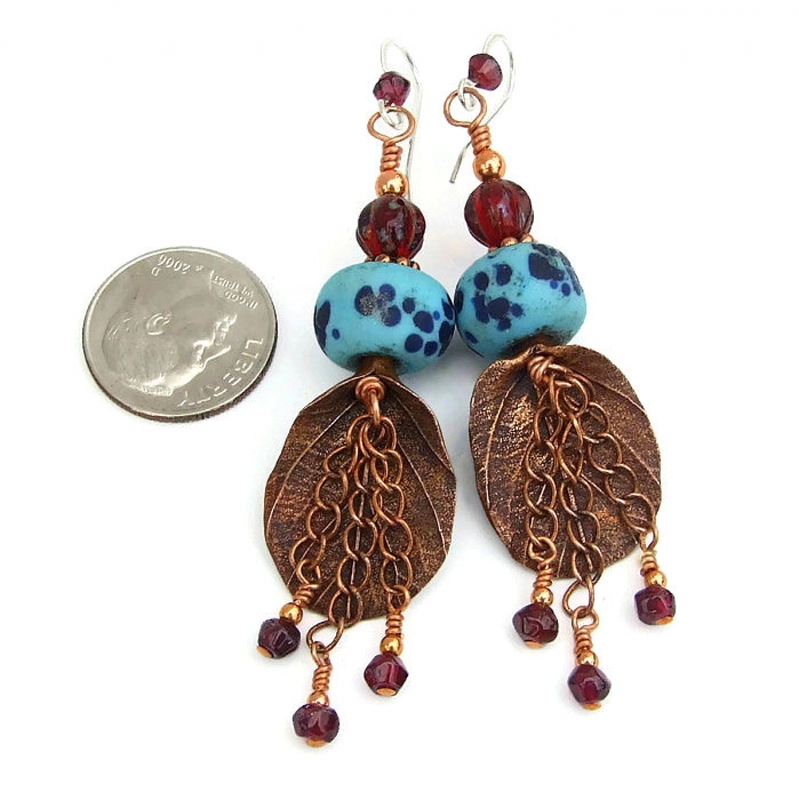 For a better understanding of the relative size of the RAINFOREST DREAMS copper leaf and lampwork handmade earrings, please be sure to check out photo #6 for a size comparison with a dime. Leaves are symbolic of the cycle of life, from fertility and growth to decay and death. Copper is said to allow the wearer to recognize barriers in the path of personal development. Red Garnet is worn close to the body to bring peaceful energy and symbolizes faith, courage, truth and compassion. Glass carries the energies of transformation, rebirth and communication. Silver is a metal of love and healing; it is a mirror to the soul, helping us to see ourselves as others see us. 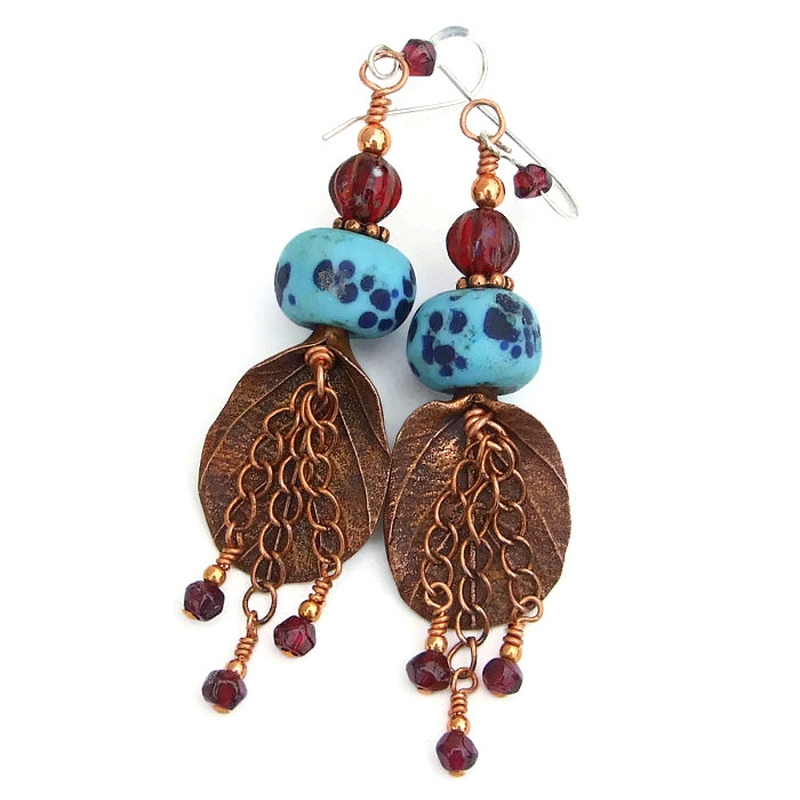 The RAINFOREST DREAMS artisan earrings were carefully designed and handmade in a dog friendly, smoke free studio. They will be carefully packed in an organza jewelry bag with tissue, perfect for gift giving to a loved one . . . or to yourself!